Not sure where I read this illustration, but I've shared it numerous times in a wide range of settings. It's one of my favorite ways to convey the essence of community. Hell, it is said, it like a big bowl of delicious soup. The bowl is 6 feet in diameter and people are standing elbow to elbow all around it. Each person has a 4-foot long spoon, which they are dipping into the great-looking, great-smelling soup. 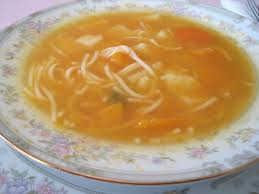 But each person around the bowl of soup is emaciated, starving, agitated and angry. Why? Because every time they try to serve themselves, awkwardly attempting to manipulate the spoon back to their mouths, most of the spoonful of nutrition spills back into the bowl in the process. Heaven, it is said, is the same delicious soup in a 6-foot diameter bowl. All the people, standing elbow to elbow around it, each have a 4-foot long spoon. Each person is well-fed and satisfied, because, instead of trying serve themselves, they are dipping their spoons into the soup and lifting it up to the mouths of those standing on the opposite side of the bowl. There is plenty of soup for everyone; all we need to be satisfied and know abundance is already present in any community. But we will be satisfied and access that abundance only if we stop trying to serve ourselves and begin to use what we have been given to serve our neighbors--and let them serve us.